The rear window defogger clears fog from the rear window. The ignition must be switched ON to use the defogger. Press the switch to turn on the rear window defogger. The rear window defogger operates for about 15 minutes and then turns off automatically. 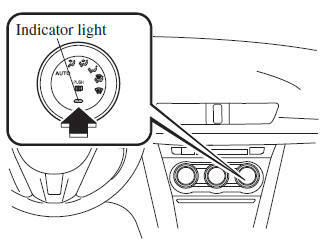 The indicator light illuminates when the defogger is operating. To turn off the rear window defogger before the 15 minutes has elapsed, press the switch again. CAUTION Do not use sharp instruments or window cleaners with abrasives to clean the inside of the rear window surface. They may damage the defogger grid inside the window. NOTE This defogger is not designed for melting snow. If there is an accumulation of snow on the rear window, remove it before using the defogger. 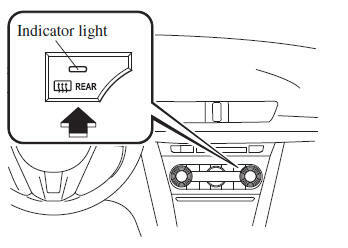 To turn on the mirror defoggers, switch the ignition ON and press the rear window defogger switch . 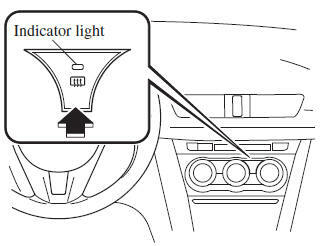 To sound the horn, press the mark on the steering wheel.